There are several types of paddle boards that cater for everyone’s needs and nearly all paddling conditions. 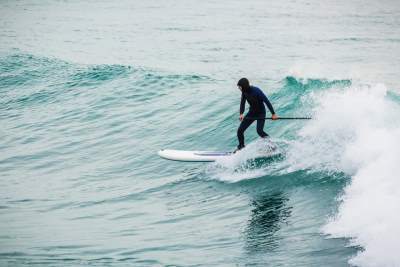 Boards can be used to do anything from yoga to fishing or racing and surfing. There is no limitation to what you can do with different types of paddle boards. We want to share with you the available options, before you buy one for yourself. You can read about which type you feel comfortable with below and then decide which type of construction is more suitable, solid or inflatable. The all around paddle board or sometimes called recreational paddle board is excellent for beginners and anyone who is not sure of what types of paddle boards to buy. This is the most common because the boards are extremely stable; they are also built to handle harsh weather conditions. They are less agile than the surf option and are slower than the touring paddle board type. This is a board not only for a beginner but also for the occasional user who just wants to get out once in a while to have fun and exercise. Typically they are from 10ft to 11.6 ft in length and are on the wider side in comparison to other types. Because they are more stable, it lends itself to having a child or small adult ride with you. A flat water SUP is a great option for anyone who loves paddling on flat calm water and wanting to go long distance. The boards are longer and narrower than the all-around boards but not long as the touring board. Flat water paddle boards are a good option if you are planning to camp along the shoreline. They are faster than the all-around boards and the surf boards. They are also stable to accommodate extra gear. Most flat water boards have a storage section where you can store your items during your journeys. The boards cover a long distance within a short while on a downwind route. The touring and race boards are mainly used for long distances or racing along a narrow water stretch. A touring board cuts through water with ease and tracks in a fast straight line.They are very narrow and longer with pointed ends to cut through the water at greater speeds. We can only recommend these types of paddle boards for more experienced paddlers as it takes more skill to use them. Fishing from a stand-up board is the best way to cast a line and exercise your body. The fishing types of paddle boards are very stable and have plenty of space for storage. 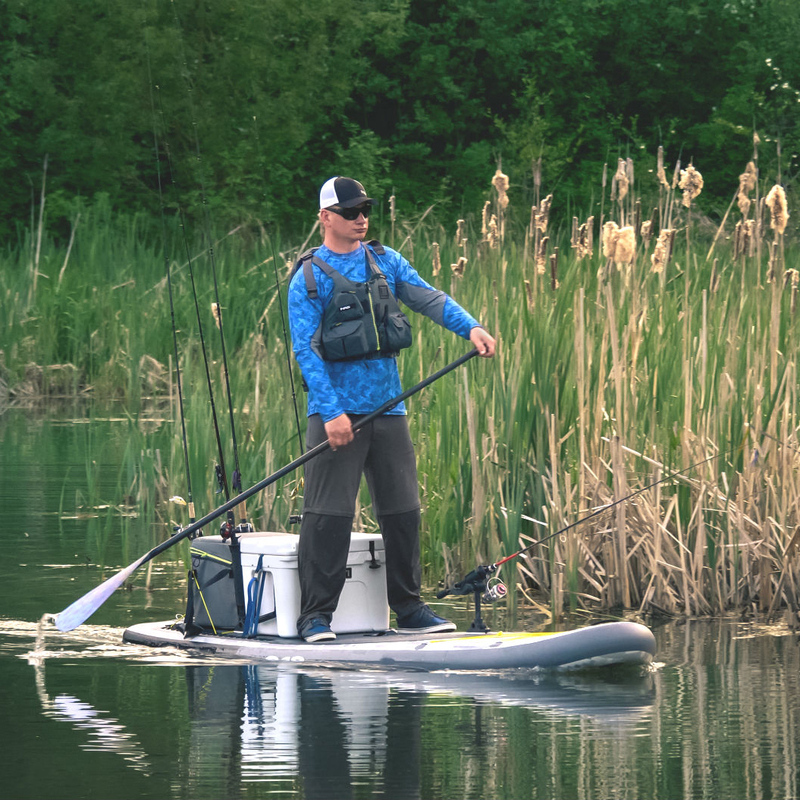 The boards offer a wide range of movement than the typical fishing kayaks. Some of these paddle boards come ready with rod holders, an inbuilt storage area and side extenders that increase stability all along. These types of paddle boards are not as fast as the rest. However, they are great for beginners looking for a stable paddle board. They would work great to get into small nooks for that special fishing hole. The surf boards tend to be slow but easy to maneuver. They are egg-shaped unlike other types of boards that are long and narrow. Surf paddles come in various lengths. Beginner paddles should have a longer end to allow them to masterstroke and balancing before paddling into waves. These types of paddle boards are almost impossible to duck-dive; you have to learn about types of waves and how to tackle each. They are designed just as they say, to surf the waves but offer an advantage over just a surf board in that you can still use it to paddle with. Doing yoga on paddle boards is the best way to improve your balance and stability not forgetting the fun that comes with it. There are fewer yoga paddle boards in the market, but several types of paddle boards like the all-around or surf board will similarly work. You only need to add a traction pad on top of the board to prevent it from being too slippery although most types of paddle boards come with non slip padding. Stability is the key here, get ready for a fun yoga workout.You can even find many classes for this in your area. An inflatable paddle board, also known as blow up paddle board, is only different in the construction of the board. Basically there are the inflatable ones compared to the solid type. I’m sure your first thought would be that these types of paddle boards would not be hard enough kinda like a raft you would blow up. But rest assured they are much more solid than you would think. These types of boards are great for beginners and anyone with limited space. They are great for people living in apartments and those with small cars. The inflatable boards easily fit into most any vehicle, making them easy to carry on trips, airplanes, or anywhere normal luggage will fit. They are also less expensive than some of the other types of paddle boards. To use the boards, all you need to inflate them the way you would a mattress. Inflatable paddle boards have become very popular and it seems because of the travel and storage convenience they may be the board of choice. 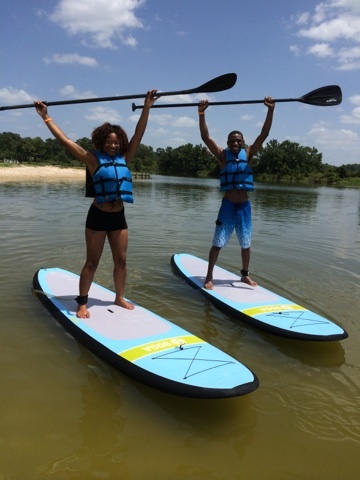 Regardless of the SUP activities, you take place in; you are always guaranteed to have fun and good exercise too. 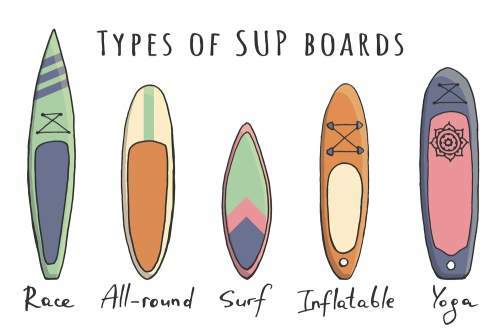 SUPs are made of different materials and come in all sizes and shapes; just find the right one for what you want to do.